Here at the bottom of a New Orleans summer it’s advisable to get your strenuous physical activity in early. The latter day hours, after the streets, the sidewalks and everything you might happen to touch has a chance to really get thermal, are more sensibly reserved for calmer, lower-impact pursuits. That’s why I am writing today to recommend "streetcar watching." Streetcar watching involves finding a spot along a streetcar route with a seat, access to cold drinks and a view of the streetcar. More picturesque than a bus, more frequent than a train, the passing of a streetcar provides a suitable excuse to sit there drinking, enjoying the scenery attached to streetcar routes, toasting the streetcar and waiting for the next. This particular activity is not new. It has probably been practiced since the very start of streetcars in New Orleans, and it likely evolved from the related practice of horse-drawn carriage watching (which is still under activist preservation in the French Quarter). But not being new does not mean it cannot become current again, as yoga, Hollywood remakes and awful ‘80s haircuts remind us daily. 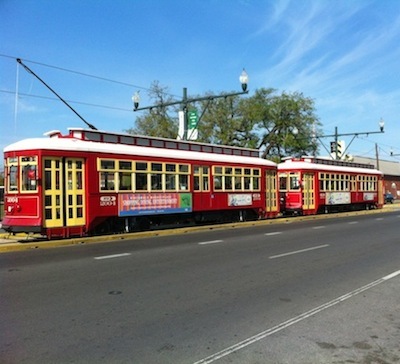 New Orleans does provide many distinctive and ideal venues for streetcar watching, and an overview sampling of these follows. But first, a little more on the practice and purpose. The spirit of streetcar watching defines streetcar watching. You may have sat around drinking within view of a streetcar route in the past, but that alone does not make for a session of streetcar watching. After all, this may not be a terribly vigorous pursuit, but it’s not passive either. It should be intentional. Your party should pay attention, remark on the passing of the streetcar and acknowledge it with a tilt of the glass. This does not mean streetcar watching is a drinking game, however. You should be sipping at your own pace throughout the endeavor. New Orleans streetcar schedules are irregular at best. If you think it’s frustrating as a commuter to wait around for a streetcar only to find a string of them suddenly coming your way, consider the implications for basing your drink consumption on that feast or famine dynamic. However,for extra style points, and to make your predictions on the next streetcar arrival seen clairvoyant, at least arm yourself with the NOLA Transit app, which provides live updates from the routes. But really, streetcar watching is not a game. It is a validation wrapped in rationalization inside an excuse. It’s an invitation to while away some time over cold drinks in our hot season counting streetcars. It’s summertime in New Orleans, after all. We all need ways to keep ourselves amused. Here’s a selective primer on recommended venues along the various routes. The Circle Bar (1032 St. Charles Ave., 504-588-2616) – On the curve of Lee Circle, sit inside and you can see the same streetcar make the turn from windows on two sides of the bar; there’s a tiny patio outside for track-level seating. The Avenue Pub (1732 St. Charles Ave., 504-586-9243) – Sure, the Avenue Pub is widely known as the city’s best craft beer bar. But for streetcar watchers its other claim to fame is the elevated view of the tracks provided by its second floor balcony. The Delachaise (3442 St. Charles Ave., 504-895-0858) – The bar itself looks like a streetcar, which is cool, and the small, fenced patio up front is under its own live oak for shade and further atmosphere. The Columns Hotel (3811 St. Charles Ave., 504-899-9308) – A deep porch braced by huge white columns, a stretch of lawn, a frame of oaks – it adds up to the grandest stage for streetcar watching. Fat Harry's (4330 St. Charles Ave., 504-895-9582) – Back after a devastating fire, streetcar watching lends yet another reason for a return visit to a bar with a long history along the route. Parkview Tavern (910 N. Carrollton Ave., 504-482-2680) – Streetcar watching can do wonders for a bar, in this case turning an inveterately smoky neighborhood dive into a first-class destination. The rows of tables and broad awning out front practically create clubhouse seating to watch the streetcars roll down this lush stretch of Carrollton Avenue. Holy Ground Irish Pub (3340 Canal St., 504-821-6828) – There’s a collection of tables outside, a wall of windows giving a good view from inside and the thematically appropriate proximity of a church just across the street to sanctify the whole outing. Chickie Wah Wah (2828 Canal St., 504-304-4714) – This is a music venue with a few tables outside under an oak. Extra points for being across the street from the transit authority headquarters and garage, so you can watch drivers duck in for bathroom breaks while passengers on board fume and text the boss to tell them they’ll be late for their shifts. Then more streetcars start stacking up behind the stopped one and, well, remember the advice on drinking games? This is purely a DIY route. Procure your own drinks, and your own chairs, and set up a streetcar-watching stand along Woldenberg Park. There are no watering holes with direct streetcar views along this newly-installed line yet, but there’s always hope as the area redevelops.